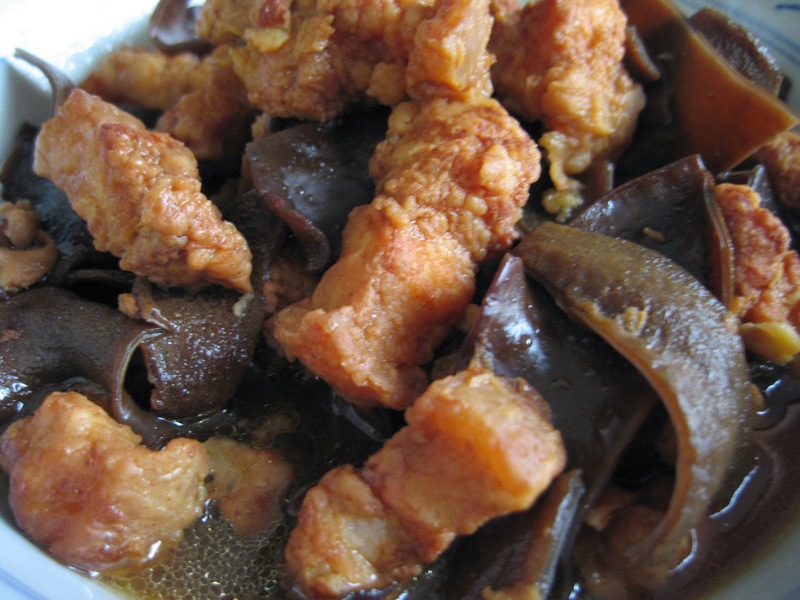 This is a popular dish in our family gatherings even though we are not of Hakka descent. On most festive occasions when we visited my in-laws I would see this char yoke braising in a big pot on the old-fashioned charcoal stove. Even now I can remember my sister-in-law cutting the huge chunk of pork belly in preparation of this very delicious char yoke. Large family gatherings are fewer and far between now that the old folks are no longer with us. At times I tend to reminiscent the bygone days. That's when I decided to cook this dish even though I do not have their recipe. It was not a problem since I had often helped my in-laws to prepare this dish. I just had to use my judgement to reduce the quantity of all ingredients used. 1. Marinate the pork pieces with the shallot juice and marinade ingredients for 4 hours. 2. Add in the beaten egg and coat well with flour. 3. Heat up enough oil to deep-fry the marinated pork pieces. Cool and set aside. 4. Bring 1.5 litres of water to boil in a medium-sized pot. 5. 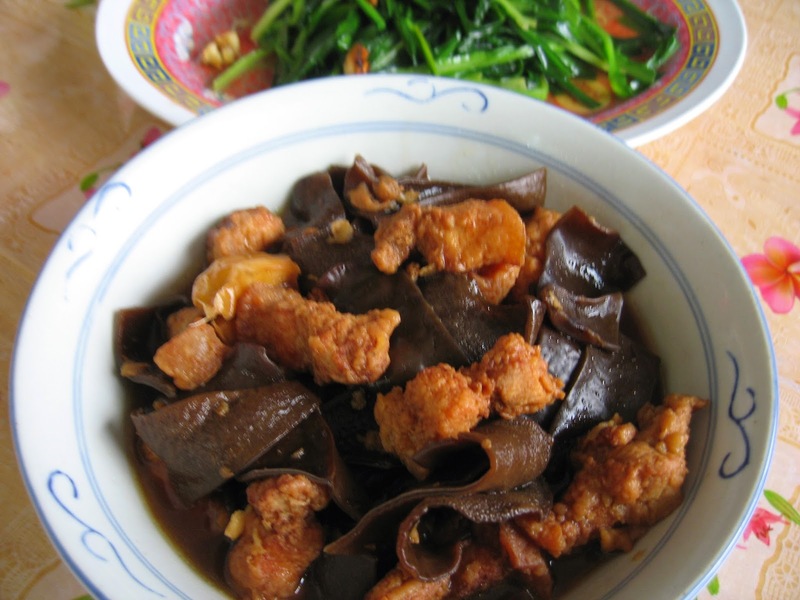 Add in the garlic cloves, black fungus, 1 1/2 pieces of nam yee and dark soya sauce. Continue to simmer over medium flame for about 30 minutes. 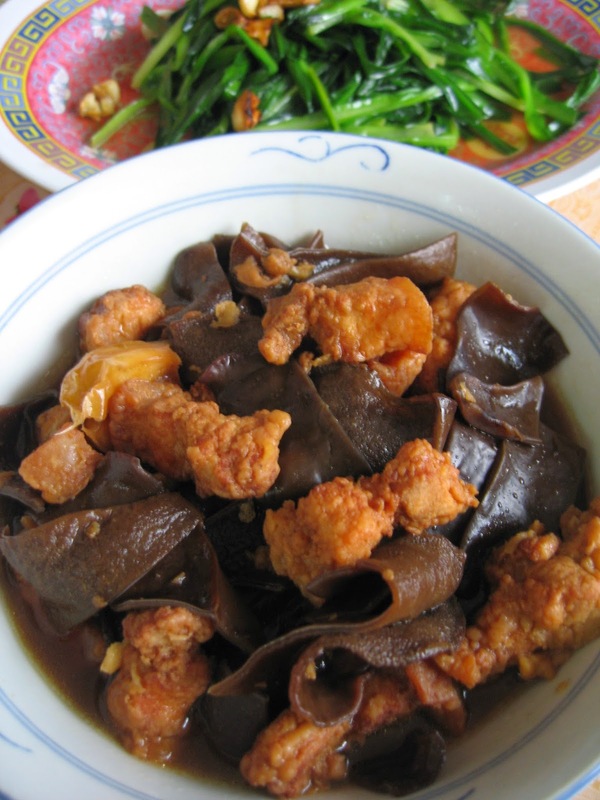 If you like the black fungus softer, simmer longer. 6. After 30 minutes, add in the deep-fried pork pieces and continue to simmer for another 30 minutes, or until the pork is tender. 7. Add in seasoning ingredients and thicken with cornflour.